I packed gear all morning. In the afternoon, I went to town to buy the rest of the food and the GORP stuff. Had supper of chicken curry, then called Hil to come pick me up. She arrived at around 9:30pma nd we went back to the apartment. I packed up the rest of the food (sausages, etc.) that Matt had. I then watched some TV and read magazines till just after midnight, when I went to sleep. I got a bit of sleep on teh couch at Matt's. He worked until 2am, and arrived home at about 3 and had a shower. We loaded my stuff in the car and left Woodstock at about 4am for the Frost Centre. A large detour on the 401 caused us a half hour delay just west of Drumbo. We stopped at Mississauga Tim Horton's for coffee, cookies and a muffin. Back on the road until McDonalds in Barrie for a washroom break. I took over driving at this point so Matt could get some sleep. Drove to Gravenhurst for breakfast, arriving at 7ish. The Elegant Goose was out of business :( so we walked down the main street looking for something else. We ended up at Blondie's, which served us the worst breakfast either of us have ever had. Nasty, uncooked bacon and sausage, rubbery eggs and stale toast all for the low-low price of $15. Stay away from this place at all costs! We continued driving to Little Wren access point. On the way to Little Wren, along Kushog Lake Road, I saw something crossing the road infront of us. We saw it as we went by--it was a wolf! We arrived at the access point at 9:20, packed up and were on the water. We crossed Raven Lake, with no wind for the first time ever! On the portage into Gun, we saw a moose print in the mud. Paddled to Brandy Falls, which had more water than I have ever seen there. A couple more portages brought us to Ernest/Herb, where we napped for a while in the sun on a nice campsite. We then paddled around to Proper Falls, which had a LOT of water going over it! Two portages, and we were in Knife. Canoe on Minis Pond In Knife, we headed to check out the cabin (as mentioned in emails with Jay Barry.) There was an old green canoe there and I yelled up to see if anyone was there. We got no reply, so decided to go check it out. We were talking full volume, and looking around outside and in the cookhouse. Matt went to open the door to the bunkhouse. He cracked it and looked in. His face changed to one of shock as he immediately began backing away and closing the door slowly and quietly. We walked back towards the canoe, and he told me that there was someone in there sleeping! We were determined to find the portage into Jean, so set about heading up the swamp towards the end of Knife. As we prepared to portage, a solo paddler came up behind us. He asked where we were going, and where we had come from. He then said he was going to walk the portage just to see Jean, but not take the canoe. The incredible thing was that he somehow arrived at the portage totally dry, while Matt and I were covered in mud! We started the portage with him behind us, but soon he was gone, and we never saw him again. We single carried into Jean, stopping to switch as we got tired. The trail was a bit faint at times, but overall not bad. We saw more moose sign here. Jean Lake from our campsite Jean is a nice lake! We paddled north, pumped some water, and made our way to camp on the north shore. We set up the tent and a clothesline, then prepared supper of sausages on buns with cheese, onion, ketchup, mustard and relish. Mmmmm... After cleaning up supper, we went out in the canoe to pump water and check out the portage into Mooney and the rapids coming in to Jean. We then hung up the bear bag, did a final cleanup, and retired to the tent. I am now writing the journal in fading light (~9:15pm.) Matt was out cold within 20 minutes of getting in the tent, and I'm ready for some sleep too! I woke up this morning to something large walking around outside the tent and snorting loudly. I woke Matt up, and we listened as it walked behind the tent, and into the water in the bay. Matt saw it (a moose!) as it climbed up the shore on the other side. 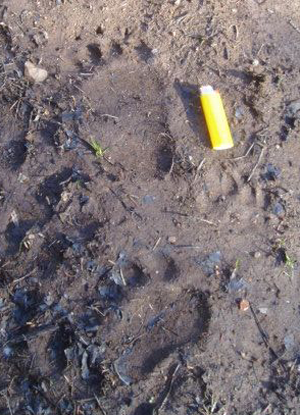 I thought that it had been a bear for sure, as it was sniffing around the food pack, which was hung ~100m from the tent. We got up and went outside for a look. There were moose tracks within 10 feet of the tent! He must have walked up, saw the tent and snorted before turning and walking behind the tent. We made some breakfast of oatmeal, freeze dried fruit and some of my dehydrated blueberries. It was good! We left everything set up, and got ready to head out with some lunch and miscellaneous gear in the green pack. The portage from Jean to Mooney was not too hard, and there were lots of moose tracks all along it. Just before halfway, there is a stream to cross coming down from an unnamed pond with a nice set of rapids. We hiked up to the pond to check it out, and found more birdhouses, like those in Minis and Knife. 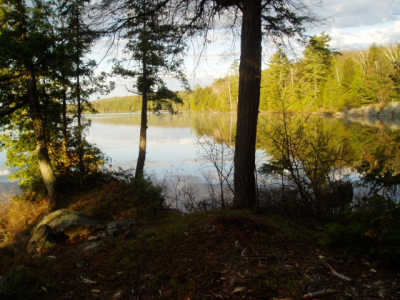 At the end of the portage, the trail crosses the snowmobile/ATV trail that is at least 15 metres wide. It was a mess--clearcut and pure mud. Lots of erosion at the bridge where it crosses the stream. 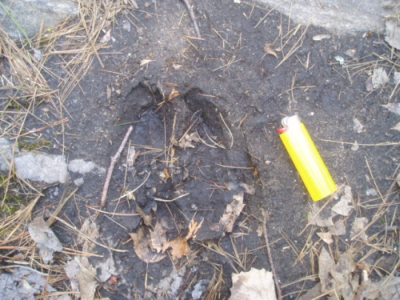 We saw bear prints in the mud, along with more moose and deer tracks. The end of the portage was a swamp with a nice clear path through it into Mooney. On Mooney, we stopped to check out the campsite on the north shore (Campsite 102) and it was totally overgrown--there was moss growing on the logs in the fire pit! There was virtually no sign of the site on the south side (Campsite 103) at all. There is a cabin on the north shore, just east of the campsite, where there were two ATVs and a motor boat. We said "Hello" on our way to the swamp on the end of the lake. 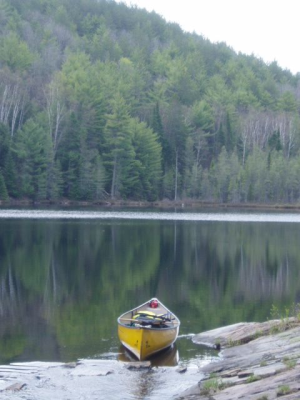 We paddled up the swamp and lifted over a few beaver dams and bushwhacked into Moose Pond. However, I thought we were in Powderhorn, as we didn't do a portage on the way, and I thought we had travelled up the first channel. Jean Lake in the evening We took a break at the portage into Hosiery, which I thought was the road shown on the map off of Powederhorn, so I still didn't clue into the fact that we were on Moose Pond instead of Powserhorn. We then headed up the stream to the east (which I thought was the stream into Hosiery.) However, we ended up in Boundary Pond, which was pure swamp. We bushwhacked south for a bit to try to figure out where we were. 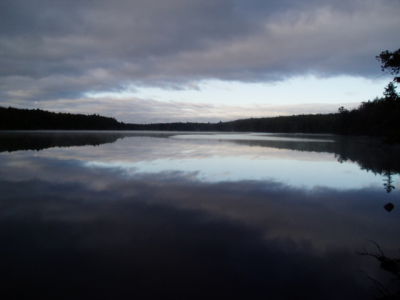 We finally figured out that we had indeed started in Moose Pond, and then walked the portage to Hosiery. We paddled to the campsite shown on the map and found nothing at all. We then paddled the narrow channel into Powderhorn, adn had lunch on the dock at the north shore. Then we went for a quck swim off of the dock. We reversed our route back into Mooney. The cabin was empty, so we stopped and checked it out. We then portaged back into Jean. We had supper of freeze dried chicken, potatoes and veggies, and went out to pump water. We dragged over a beaver dam into Cranberry Lake. 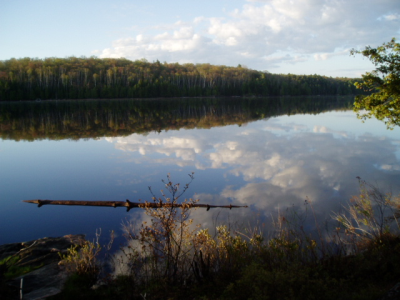 It's a nice lake with no campsites or cottages. On the way back to camp, we checked out the Heron Rookery on Jean. We didn't stick around long, as we didn't want to disturb the birds. There were at least a dozen Herons and 6+ nests. Woke up to the sound of a grouse behind the tent. Got up and had breakfast of oatmeal, and packed up to go. We paddled down Jean and portaged into Knife. 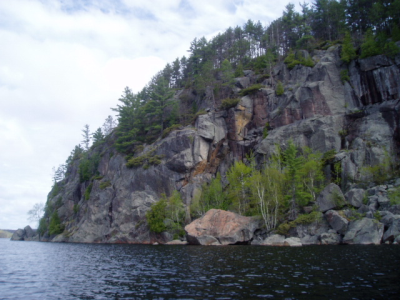 On the portage around Proper Falls, Matt spotted a canoe pulled up on shore, locked to a tree at the top of the hill. We headed into Ronald, then Nehemiah. The campsites in Nehemiah were taken by fishermen. At the south end, we paddled up and asked if thre was a trail to the road from the campsite--there was, so we carried up onto the road and headed south. We followed the road until we met a stream across the road, which we followed into Emerson Pond, just north of the campsite (73A). We pumped some water, then decided to eat lunch on campsite 73 before continuing. We had stoners, cheese and jerky. We then began bushwhacking our way down Avery Creek, starting with four beaver dams in the first 30 metres. That was followed by a steep v-shaped channel filled with downed trees and rocks. IT was rough going, but we made it out to the swamp at the north end of Little Avery. Parts of the creek along the way were underground, as we could hear the stream gurgling through the rocks. We walked/waded a bit of the swamp until the lake opened up. The site on Little Avery looked really nice, but was taken. We walked over into Bruin Lake, but left the boat on Little Avery. We took a look to see if the site was taken. 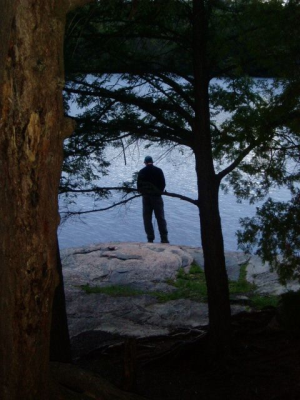 It was, so we made the decision to go meet up with Randy and Candace, who we knew were camping on Sherborne Lake. We portaged into the very pretty Sundew Pond, then across into Sherborne. We started checking campsites, looking for Randy and Candace. In about the middle of the lake, Matt spotted them paddling up to a site on the small island. We paddled up and stopped. They invited us to camp with them, so we did. We chatted with them for a while, then set up camp. We went for a quick, cold swim off the rock. Supper was spaghetti with dehydrated meat sauce (lots!) After supper, Randy wanted to go fishing, so the 4 of us went out for an evening paddle/troll. Just by the portage into Silver Doe Lake, Randy hooked a nice trout (~5.5 lbs) which he tied to a stringer. Matt took the stringer and tied it to the carry handle on our boat. As we paddled back to camp, the knot came undone (?!?) and the fish started swimming down. Matt and I started paddling backwards, and he tried to grab the end of the rope, but just missed it! We had a good laugh about it, and there may be a nice sized trout swimming around Sherborne Lake with a rope tied to it! Later, we were putting up the bear bag. After Matt tied the pulley to the rope, and raised it up, I was pulling the second rope through, and the pulley came untied and shot straight at my head. I somehow avoided a concussion, but Matt now has to go back to knot-tying 101! We had a nice campfire and cleaned up all of our gear before turning in for the night. Woke up this morning at around 5:30 and got packed up. Breakfast of eggs and toasted bagels (too much cheese and spices in the eggs...take less next time!) By 8:30, we had everything packed up and had said goodbye to Randy, Candace and Yosemite. We paddled west across Sherborne to the portage into Plastic (kinda steep and rocky.) In Plastic, Matt saw a deer just before the portage. We carried into Raven, then paddled up along the cliffs to pump some water before continuing to the Little Wren put in. We portaged around the dam and were back at the car by 10:50. We cleaned up and loaded the car before heading home via highways 118, 11, 400 and 401. We stopped at Webers, and later at Wendy's for a Frosty. Traffic was not too bad in Toronto after being stop and go from Orillia to Barrie. We made good time on the drive overall. Once again, another great trip! Bugs were out and annoying, but not yet biting, and the weather was not too bad, although we didn't get a whole lot of sun. I am glad to finally have made my way past Knife Lake, after being turned away twice before. The moose, deer and wolf sighting were nice, and it was good to see Randy and Candace as always.